Barangay Singalat is a hinterland,a remote barangay of the Municipality of Calamba, Misamis Occidental. It was formerly known as Sitio Bagakay, part of Barangay Siloy, the adjacent barangay of Singalat. The term “Singalat” is a Subanen word which means that “people are carrying basket on his shoulder” and the term “alat” means basket. People in Singalat used to make baskets to put in their harvested farm products for family consumptions. 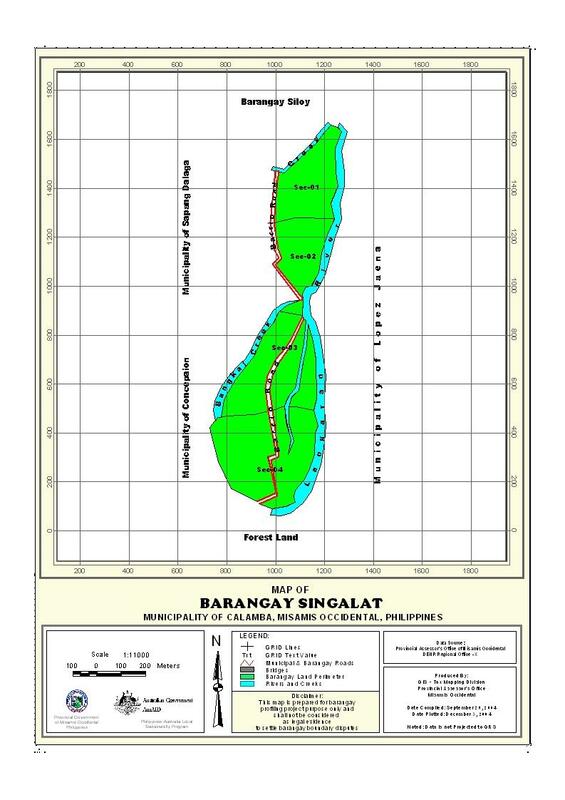 Barangay Singalat is geographically located in the southern part of the Municipality of Calamba. There is a lowland part in the area but most part of the barangay is hilly and mountainous. It is 17 kilometers away from the poblacion of Calamba passing thru barangay Salvador, Bonifacio, Siloy and Mamalad. It is approximately 7 kilometers away from Barangay Mamalad. From Barangay Mamalad, one has to walk and cross the Langaran River seven times before reaching the area of Singalat. There are three puroks that surrounded the whole area of Barangay Singalat. Purok 3 has the greatest number of population which is 125 compared to Purok 2 which is 100 and Purok 1 has 73. It has an estimated land area of 7.5652678 square kilometers and has 259,4326 square meters agricultural lands. Barangay Singalat has a rolling terrain and outside the country’s typhoon belt. The land is classified as agricultural. Its soil is suited for agriculture. The lowland part of the barangay is along the river while the mountains are also fertile land. Its soil type is Castilla. Barangay Singalat has no pronounce dry and wet season. Rainfall is fairly distributed throughout the year. The land area is more on agriculture. Agriculture is the main source of livelihood in the barangay. Coconuts share the biggest percentage of the total land area. Farmers use the land to plant corn and other cash crops, such as banana, camote, cassava, gabe and other cash crops.